With the unseasonably warm weather, people are not the only creatures trekking to Ocean Shores Washington. 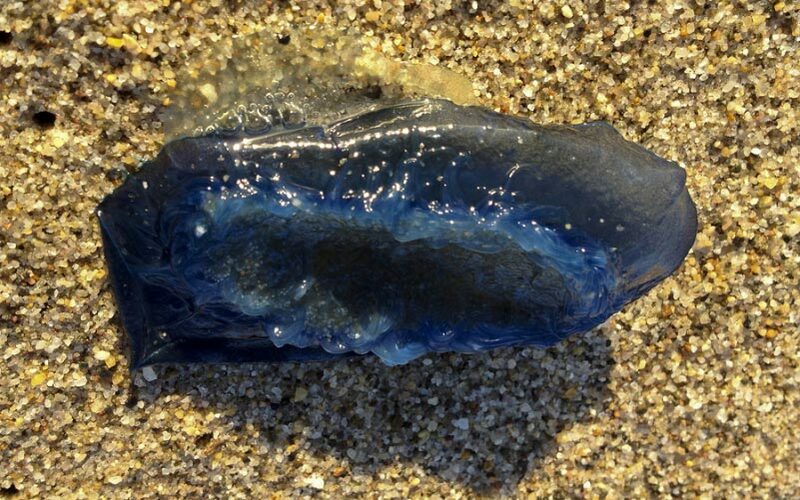 The aptly named Velella Velella jelly fish have been washing up by the millions on West Coast Beaches. "They do look messy," said Jackie Martin, a property manager at By the Sea Vacation Rentals, "The last time we saw these was six years ago and they washed away fairly closely." The warmer temperatures causes the creatures to migrate closer to the land and in the millions. When the wind blows in a certain direction, the jelly fish are blown off course and up onto the beach. As small cnidarians, Velella Velella are members of a an ocean surface community that includes the better-known cnidarian siphonophore, the Portuguese man o' war. Each individual is about 7 cm long, usually deep blue in color with a small stiff sail that catches the wind and propels them on the surface of the sea. Velella Velella are carnivorous little guys, catching plankton in their tentacles that hand down in the water They are not poisonous, and they do not have a sting. Says Martin, "They can be handled with out any problem, but people should wash their hands after touching them." The wind and high tides may wash them right off the beach, or they could be in evidence for months all the way into summer.